Kim Hammond & Tracey Loh report from Albany, New York where the world's largest mystery fan convention, Bouchercon, is taking place. This is the second report from this year's convention (the first is here). Dana Cameron got to spend three months in London at the London Museum doing research. 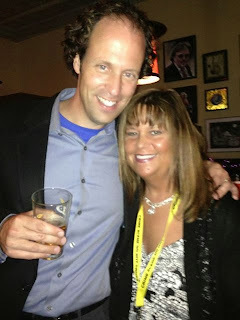 Then she told a story that happened while she was attending Bouchercon in Anchorage. She wanted to fly into the Alaskan bush but you could only go in a very small plane. It has a reputation of being one for the 10 most dangerous air trips in Alaska. While on the flight, the door of the plane flew open on its own and the pilot told her to just hang on with her legs and pull it shut - btw there were no safety belts. When they finally landed it was on a very short landing strip at the top of a mountain. Sean Chercover worked as a real Private Investigator for six months to research one of his books. He even got the license to be one in Illinois. Has met a lot of people in law enforcement by calling them up and asking questions and the next thing he knows he's out buying drinks and getting all kinds of stories. He has also met with a group of mercenaries just back from Iraq. Alafair Burke uses her marriage for book research. Her first Ellie Hatcher book featured a killer finding victims on online dating service, exactly how Alafair met her husband on an online date service. Hmmm, experience with serial killers? Lou Berney writes off beat crime with humor. In one book he had drug cartels using powered hand gliders to bring drugs over border. He was in Hawaii with his wife and he would take an hour class on a power hand glider and he thought it would be good for research. It's like a go cart with a big wing and a lawn mower engine on the back. He did it anyway. Gets in a flight suit and helmet. It was the most scared he's ever been. They were way up in the air and then the instructor says "uh-oh." Hmmm. Chris Holm - His books are supernatural in origin and while they aren't horror, they have horror elements. So while he's writing a horror scene he tries to scare himself. He has a horrible scene where the main character wakes up and is covered in bugs. He had an incident as a child with bugs that terrified him. Another favorite panel was the Jungle Reds. It was hilarious and interactive. I don't know how to describe it so you'll just have to make a note to attend their panel at the next conference. 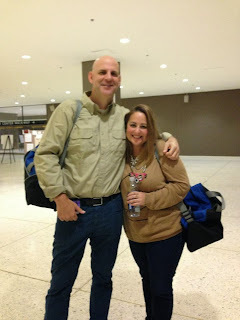 In other sightings out and about at Bouchercon, we ran into Harlan Coben (that's Tracey with him). In other news, at today's meeting the bids for Bouchercon 2016 in New Orleans and Bouchercon 2018 in St. Petersburg, FL were approved. Congratulations! Don't forget to "like" the Mystery Playground page on Facebook. #1 I hate you for meeting Harlan Coben - yet again without me. #2 you are correct, Daniel looks even better. You'd better tell Harlan we're talking about Six Years Monday in Crime & Beyond in Colorado. He needs to come out to Colorado for a book signing and make a guest appearance. Sounds like a great conference. Can't wait to read more. There are many companies that offer professional tenant checking services by which landlord can asses the risk factors of property lease to a prospective tenant. These services are streamlined and accurate and you and have them done in a short while.